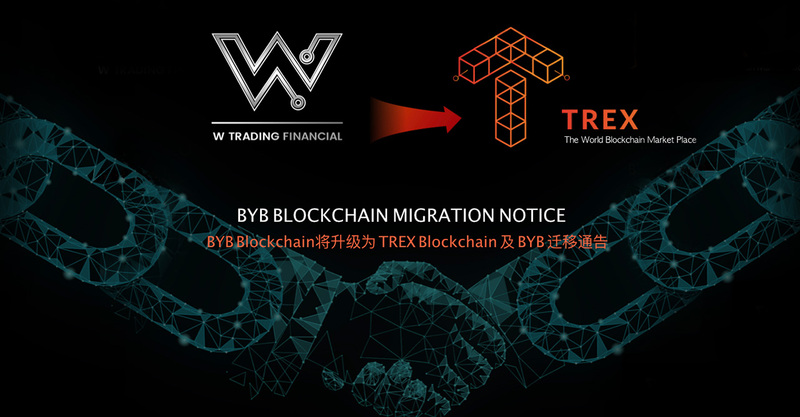 Since the BYB BlockChain will be upgraded to the TREX Blockchain, W Group International will be suspend all W Trading Financial (WTF) and TiDeal.com online trading and transfer program system services. We will transfer the original BYB to the new wallet and decided that we will send 1 TREX Coin for every 100,000 BYB, as a transfer bonus. We will issue the same number of Tokens on TiDeal.com and also decide that we will send 1 TREX Coin for every 100,000 BYB, as a transfer bonus. So the existing BYB token holders will not encounter any trouble during the transition period. The process will make the user feel that nothing has changed except for the new wallet with the extra TREX Token. In case of special circumstances, the timeout may be extended or terminated earlier, and will be notified later. 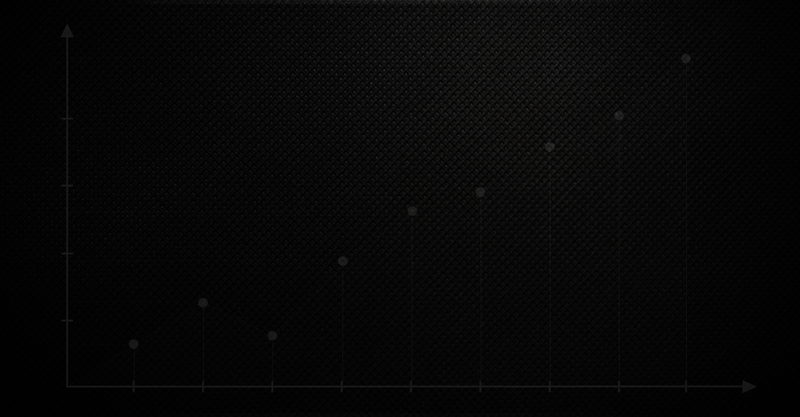 After the system upgrade and maintenance is completed, all services will be restored immediately. Users are requested to make relevant arrangements in advance. Due to the inconvenience, please understand and keep supporting us ! W Trading Platform is live now for you to trade BYB Coin as well as other cryptocurrencies. Click the button below to download and explorer more. 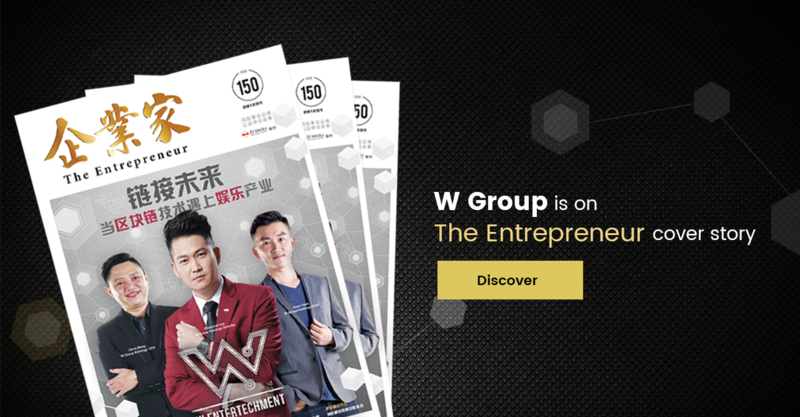 W Group is a company that combines the entertainment industry with technology to establish and strengthen the entire entertainment industry through artist-based management, film or music production, investment and promotion, both online and offline. 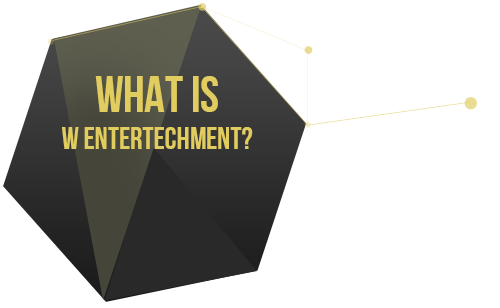 We combine the entertainment and technology, such a business model, we call it "W Entertechment." 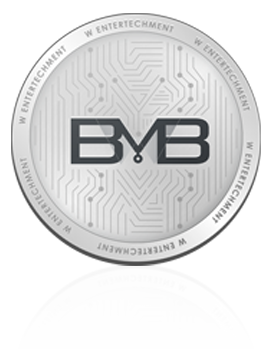 W Group aims to penetrate the entire entertainment industry by creating its own digital currency "BYB". The BYB agreement enables both parties to transfer funds instantly and directly. Such an agreement can bypass the cost and waiting time of a traditional brokerage system and can be redeemed for any type of currency, including the U.S. dollar, the euro, the yuan, the yen, the ringgit and the reward points. In order to safeguard security, BONUS relies on a "common ledger managed by an independent authentication server network". The server will keep comparing its transaction history. The server can belong to anyone, including a bank or a merchant. BYB is not only used for investment or expenses in the entertainment industry, but also circulated in the retail industry. 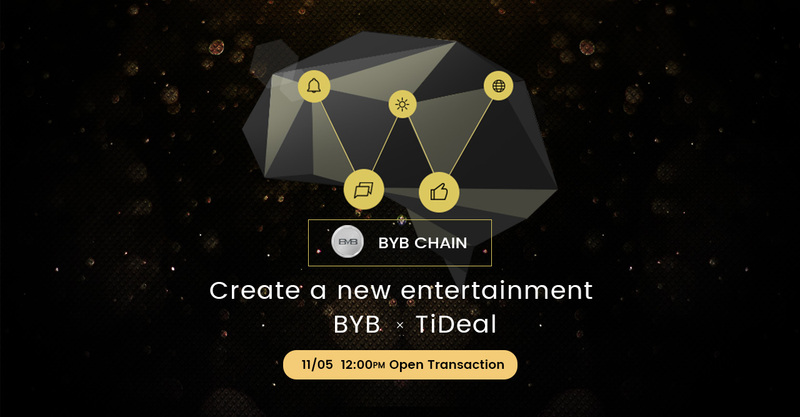 BYB Chain will provide the rapidest and the most transparent decentralized platforms for entertainment industry in the world. The key features of the chain are the flexibility, interchain, immediate payment, smart contract, big data, AI, we will make all users become beneficiaries. 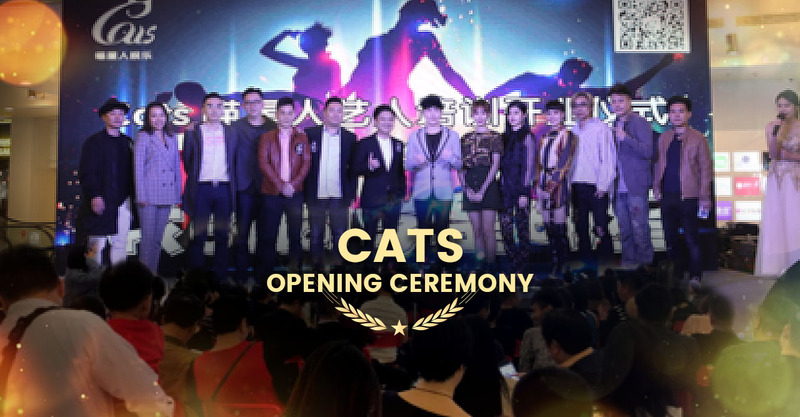 BYB chain ready to bring the entertainment industry into the blockchain ecosystem, in order to be fast, intelligent and diversified industrial operation mechanism, we will implement the combination of big data, blockchain and artificial intelligence devices to change the industrial ecosystem. BYB Coin is easy to use, safe, fast, reliable and with many other functions. BYB’s hard cap at USD 75M, but it is currently hot selling in pre order stage, resulting in the scarcity of coin. 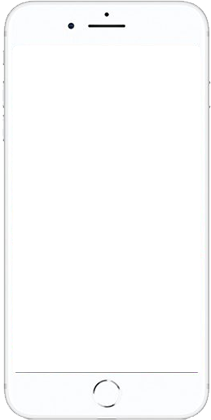 W’s artists, referred as BA. With their various talents and skills, fans accept the degree of screening and other aspects included in the platform. Devaluation is expected to push 10 all-round debut. Collaborate with third parties to create personal, exclusive apps that increase revenue and value through RPM calculations. Cooperate with the third-party live broadcasting platform and support through benevolence. You are able to buy BYB in better price before ICO to public. W App will be the most complete integrated platform for entertainment industry. 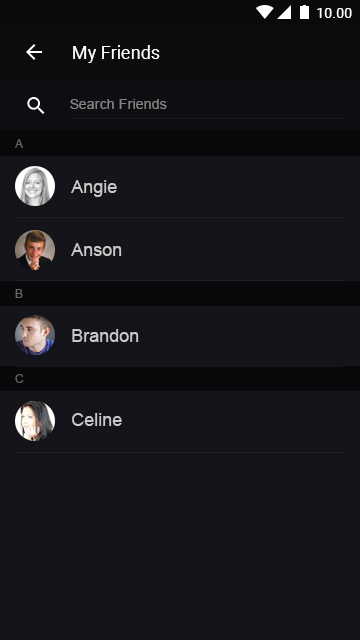 Internet celebrities/artists can interact directly with their fans through personal channel in “W App”. 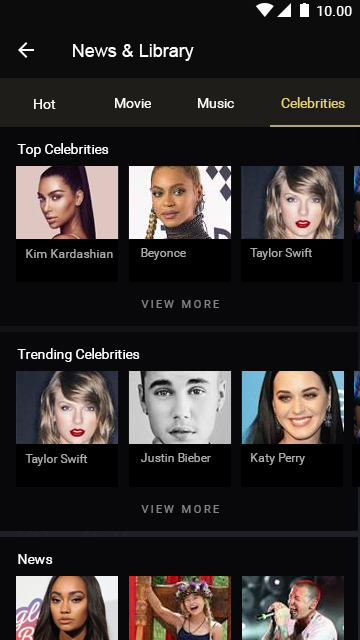 Brand merchant/advertisers able to compare the characteristics of each internet celebrities/artists directly and find the most suitable and candidate that meet their financial budget for their event and to improve the market in a more effective way. BYB more advantages compared to other crypto currency advantage, because our currency is developed for the Chinese entertainment industry. So its own appreciation rate will be faster compared to it. The entire structure of BYB will be able to maintain 1200 transactions per second on a BYB-SUE basis and confirm the transaction in one second. The BYB technology will be used for payment, so the user can directly transfer the goods directly to the merchant via P2P mode so as to directly deal with it. In addition, BYB will also be used for crowdfunding and contract development, such as crowdfunding for movies or commercial contracts. 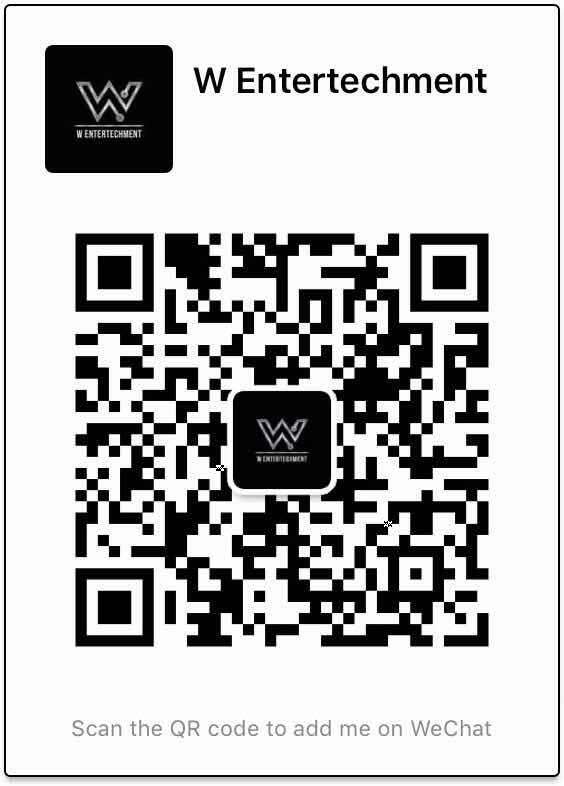 W Group combines management talent in all aspects of entertainment project investment, artist management and technology development, coupled with the application of blockchain technology to enable the Group to manage its business more effectively. was founded in 2007. Unlike the traditional media buying houses and advertising agencies, Omar has the advantage of integrating all aspects of marketing and entertainment marketing, presenting resources other than media buying and media planning, creating advertising departments, planning brand strategies based on customer needs, keyword advertising.. It also cooperate with Tokyo Dream Kid Inc. Japan to establish Datang International Entertainment Co., Ltd. , to invest in both Taiwan and Japan cultural industry such as television series, movies and others, fully integrate both country in media procurement plan and media buying in order to help customer’s brand to achieve cross strait operations. Omar is capable in using the marketing budget wisely. 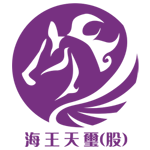 was Founded in 2016, Hai Wang is dedicated to the production of television dramas, movies, online productions, distribution, entertainment and artists’ brokers. It has a highly qualified and professional team with rich experience in the field of film and television and a first-class planning, management, operational personnel and senior producers, directors, actors and other rich human resources. With Japan, South Korea, the United States and other overseas companies have copyright sales cooperation. Entertainer Brokerage is the focus of the development of the king of Emperor Xi Xi business, has its own artists, including Xu Weien, Guo Yanjun, Li Mi, twinko; new generation of actors, Du Jixiang, Song Aaron, Gore, Xian Yuqing. （known professionally as Sony Music and abbreviated as SME, is music subsidiary of Japan SONY. Formerly known as SONY BMG Music Entertainment. In 2004, Sony and Bertelsmann established a 50-50 joint venture called Sony BMG Music Entertainment and transferred businesses of Sony Music Entertainment (former CBS Records) and Bertelsmann Music Group (BMG; Ariola, Arista, RCA Records, etc.) into the joint venture, although later in 2008, Sony acquired Bertelsmann’s stake and the company reverted to the SME name. 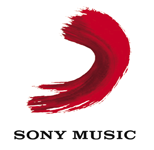 In April 19th 2012, SME aquired EMI Music Publishing for USD 2.2B, Sony has thus become the world’s largest music library. GIB(GIB4U.com) is one of the top blockchain development providers, the fintech team never stops innovating. Having a wide experience in developing secure applications, the company provides blockchain development services to help businesses in blockchain adoption. GIB offers blockchain consulting, delivers proofs-of-concept and helps to bring clarity and understanding of that complex technology. It helps to gain an advantage before competitors bringing more transparency to business with the power of impact tech chains and mobiles apps, integrated into blockchain.GIB provides Exchanges, dApp. Off-line wallet, and blockchain service, and has great Influencers to current chain ecosystems. was founded in 2015, providing a one stop technology consultation services specially for business clients in all fields from local and overseas, as well as to develop exclusive website and mobile APP for clients with different needs in the fusion of advanced network technology. It has created more than twenty websites and APP for different customers within two years, which includes crowdfunding platform, B2B2C shopping platform, O2O offline consumer application, instant messaging APP, event ticketing platform, sharing office platform and third party payment platform. The other main operation of Mi Fun Network is to provide backstage and front stage system consultation services specially for multi-level marketing company, using sophisticated technology based on the requirement of individual customers, to create a leading network product for our customer to lead the industry and outshines others. was founded in 2013. It is a high end technology platform which create individual APP. Its innovative concept application has been accepted and used by hundreds of celebrities, artists, professionals and bloggers all around the Asia. The application is to increase revenue, to set celebrity/brand worth. Do you want to get the lastest news from us? Follow W social accounts! responsible for the financial operation of the company and has the final decision in board of directors. He is specialized in planning activities and to help enterprises to have incredible sales. There was once he exceeded USD 17 million in sales! He established a media public relationship and event planning company in 2010. He has 16 years of experience in event planning. He had held over 100 annual dinners, and promoting events in Taiwan, Cambodia, China, Macau and also Malaysia. The largest event he held before was more than 20 thousand people. Moreover, he also organise two concerts in a year, which includes Zhang Dongliang’s 2015 Malaysia concert and Taiwan famous singer Bi Shujin’s first Malaysia concert in 2015. Other than that, he also participated in the investment and production of several foreign movies. His team was supported by Malaysia media. It is a famous company in entertainment industry which handle movie promotion planning in Hong Kong, Taiwan, Singapore, Malaysia, Korea and Thailand. The movie box office has a breakthrough of 7 million Ringgit Malaysia of success. He is the founder of Gorgias Asia. This platform works with few hundreds of celebrities and media from social medias. He is very enthusiastic and passionate. He always hope that he can bring entertainment industry to another level through technology. He has 18 years of experience in marketing. He is a singer since 8 years old. He never give up and always move forward. Previously, he established a e-Learning Institute (E-Mission Mobile Training Institute), LinkClub (Loyalty Program) and others. He mainly dealt with the internal policies and procedures of the company. He has many years of experience in network technology, always lead the team to pursue with new technologies and constantly applying it in creating innovative network projects. He has a wealth of technology experience in North America and he brought it back to his hometown. He cooperated with others and established the famous online group purchasing. Australia ASX is successfully listed after few years of operating this project. After that he established MiFun Network and continue to lead the team towards higher technology. Taiwan director, producer, executive director of Tetsuo True Color Production Co., Ltd., director of Haiwang Tiuxi Culture Media Co., Ltd. is responsible for the company’s business development, promoting the production of a number of films, co-investing with China and Hong Kong to produce films and is favored by famous Hong Kong director Chen Jia. Many overseas film productions have close cooperation with Hong Kong Meiya, Sun Entertainment and Seven Entertainment. In 2017, he directed his works,Beijing No. 81 2 set a record of 250 million yuan in China at a box office of nearly 1.1 billion Taiwan dollars. Now W Group Holdings group film director. He holds a UK law honorary degree and an Australian MBA. He is currently a qualified practicing lawyer in Malaysia and a registered financial planner. He has expertise in a variety of legal matters including but not limited to joint ventures, corporate law, property transactions and banking, agency/distribution, housing projects, matrimonial disputes/ settlements, dispute resolution over construction contracts ranging from tens of millions to hundreds of millions of ringgit and had appeared in various courts including the federal courts to conduct civil litigation for clients. He had also conducted seminars, rendered legal advice and proposed solutions for, inter alia, American International Assurance Company Ltd and Standard Chartered Bank Malaysia Berhad’s loan department on civil litigations, loan recovery process and procedures in sale and purchase/loan transactions. In addition, he had also worked for a business group and had accumulated a wealth of experience in managing and supervising various departments namely legal, credit control, cost cutting, sales & marketing and other responsibilities and had gained much experience in the conduct of business in the corporate sector. His legal knowledge coupled with business experience has also enabled him to effectively assist his clients in negotiating business deals with their Chinese counterparts from China in trading, property development & acquisition and joint ventures. Until now he is still assisting his clients in potential projects worth hundreds of millions of dollars in China. He had also provided legal advice and solutions to the public and readers of Sin Chew Daily, an authoritative Chinese newspaper in Malaysia, whose legal advice and solutions were published in the "Fortune Weekend" in Sin Chew Daily. He was also one of the panel lawyers for the Disciplinary Committee of the Advocates & Solicitors Disciplinary Board of the Malaysian Bar Council and was authorized to investigate such lawyers who hade been complained of their misdeeds by their clients.